It’s common in VR to be able to interact with the world simply by looking at it. This is called gaze based interaction. From menus to game mechanics, gaze based interaction is a powerful VR tool. This lesson assumes you’ve gone through the Materials lesson and are comfortable with updating materials dynamically. Before we jump right into it, let’s review what we’re starting with. 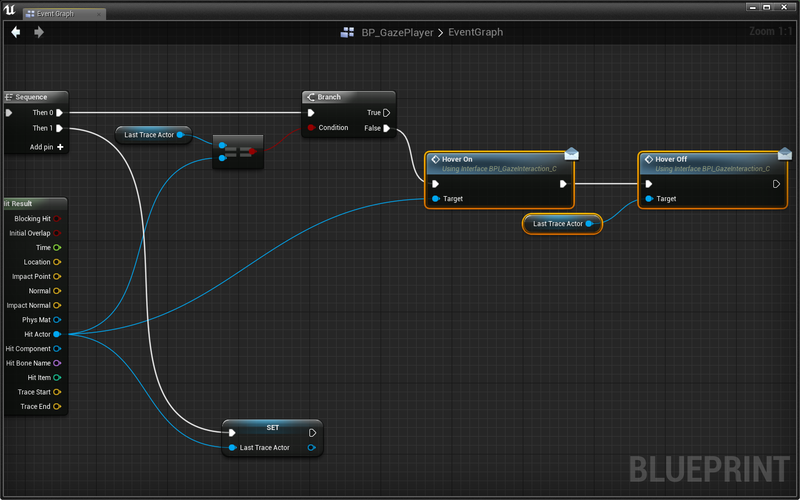 BP_GazePlayer is the character pawn we’re going to be adding our selection logic to. 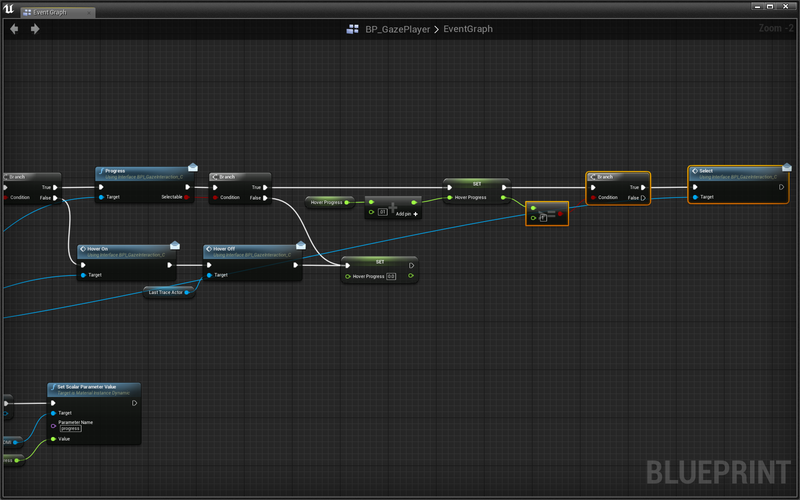 It’s already set up with a reticle and a Dynamic Material Instance variable for the reticle called ReticleDMI! You may notice that the reticle is not implemented with a trace. Instead, it uses a Spring Arm component. We used the Spring Arm component in Lesson 4 to add a smooth lerp effect to the 2.5D camera. We use the Spring Arm here for the same reason. 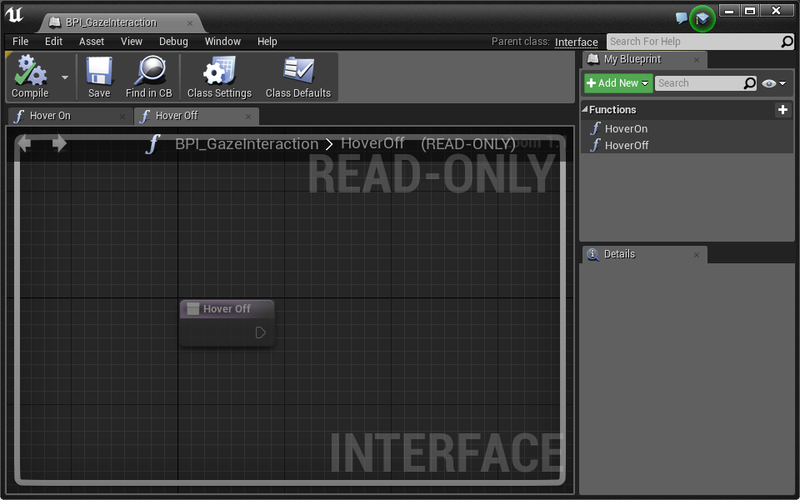 Hover over any of the details in the editor to get a description of what they do. 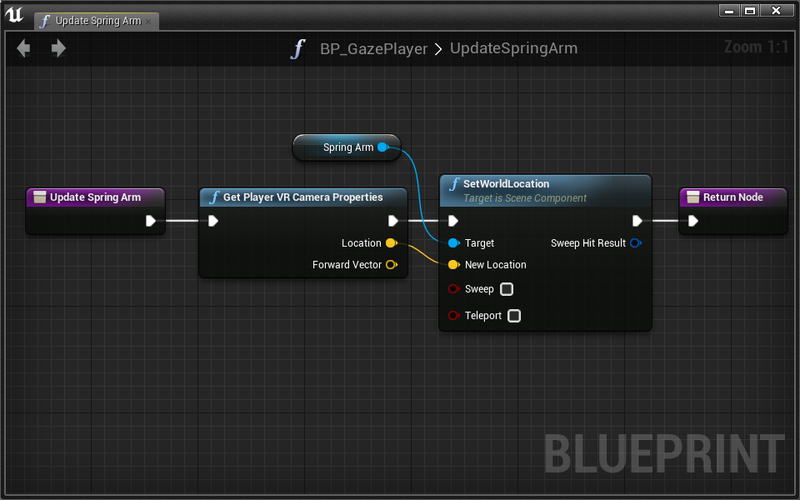 Finally, in the Event Graph we call a function called Update Spring Arm on Tick. Open the function and you’ll see that it ensures the SpringArm is rooted at the exact position of the player’s head. This solves a problem where the HMD and spring arm are not in sync due to translational movement, causing the reticle to be a bit off center. Attached to our SpringArm is a reticle made with a MaterialBillboard. This reticle uses the M_ProgressReticle material which is set up to show progress with a radial selection bar. It utilizes a Progress scalar variable that goes from 0 to 1. 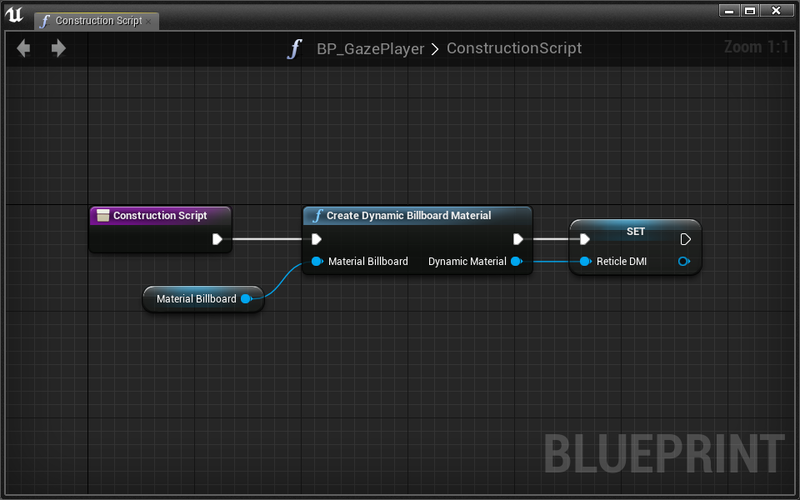 Since we need to dynamically update this material, the BP_GazePlayer has a ReticleDMI variable that is set in the ConstructionScript. Notice the new Create Dynamic Billboard Material which is a Layout utility node meant to take a MaterialBillboard and return a dynamic version of its material. Many people prefer the smooth lerp of this reticle. Consider using this setup moving forward. 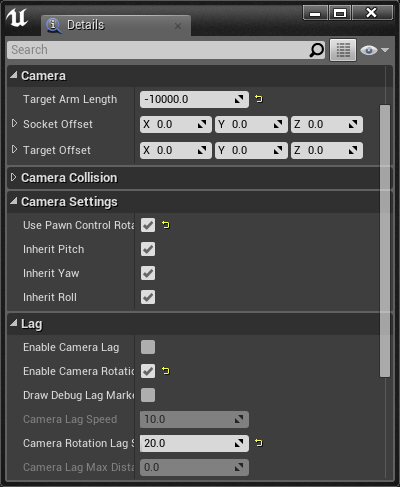 Of course, you can change the amount of lag by updating the SpringArm’s Camera Rotation Lag Speed setting. 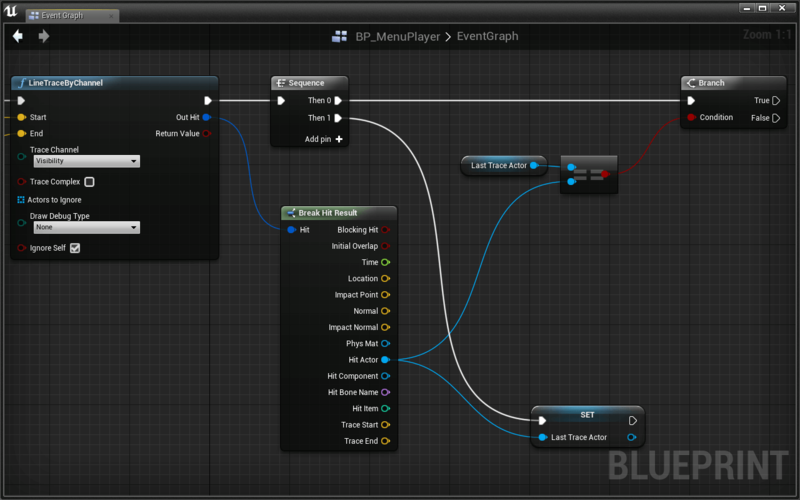 This type of interaction, one that we expect to happen all over the place, is perfect for a Blueprint Interface (BPI). Let’s start by adding messages for Hover On and Hover Off. We’ll use these to try and communicate with actors in the world from our BP_GazePlayer. Before we jump into the BP_GazePlayer interaction, let’s set up a button that implements our new Hover On and Hover Off events. In order to communicate with actors in front of our player on gaze, we need to send out a trace every Tick. Back to basics: set up a Line Trace By Channel that traces from the player’s eyes to 10000cm out in front the of the player every frame. Great! To send the Hover On and Hover Off messages, we need to know when we’ve hovered over a new actor. To do that, we have to store the actor we traced last tick, then check if it is the same actor we just traced. Connect our new Last Trace Actor variable to the other == input. We just set up a Branch that tells us whether or not we are tracing the same actor as we did the previous frame. The Sequence is used to set our Last Trace Actor variable at the very end of the tick. All of this will help us hover on and off other actors. In this case, we’re not using the LineTraceByChannel > Return Value with a Branch because it is unnecessary. If our trace doesn’t hit anything, the hit’s Hit Actor will return NULL. Make sure you understand what’s going on with our Last Trace Actor variable and the Branch. Take your time to trace the execution path if it’s confusing you. Send the Hover On and Hover Off messages to Hit Actor and Last Trace Actor at the correct time. Hint: Find the execution path that defines when we have hovered over a new actor. At that point, send the on/off messages to the proper actors. Awesome! Go ahead and test it out. When you look at the button in the world, your strings should print “hover on” and “hover off” appropriately. Rather than print strings, let’s use our DMI to change the color of our button. 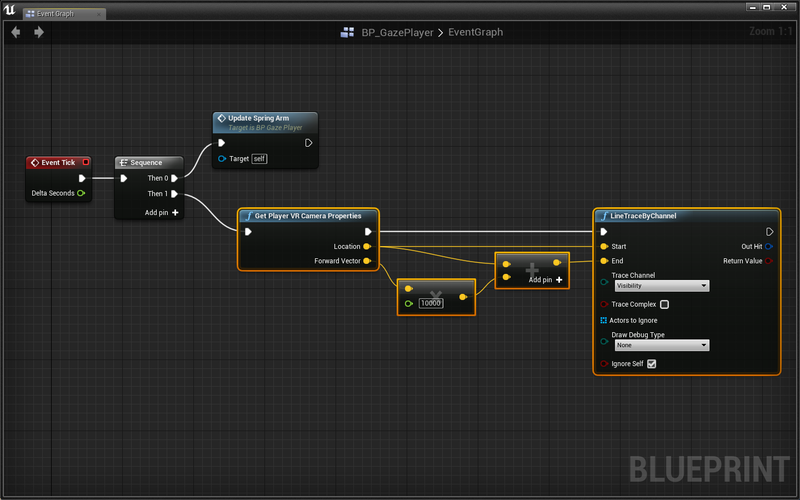 Use the DMI variable to change the color of the button when it is hovered on and off. 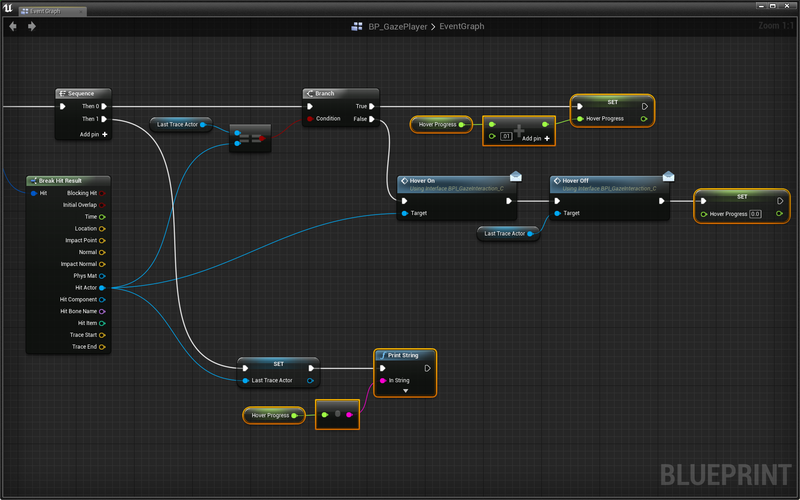 You’ll want to change the “color” parameter of the material which can be done with a Set Vector Parameter Value node. To get access to the Set Vector Parameter Value node, you must first drag in a reference to the DMI variable, then pull a wire out of it to access its context sensitive menu. Add 0.01 to the HoverProgress variable if we’re hovering over the same actor as last tick. If we’re not, set HoverProgress back to 0. Great! Rather than print the numbers, let’s use our M_ProgressReticle’s scalar “progress” variable. Use the ReticleDMI variable to update the “progress” value of the reticle. You’ll want to change the “progress” parameter of the material which can be done with a Set Scalar Parameter Value node. To get access to the Set Scalar Parameter Value node, you must first drag in a reference to the ReticleDMI variable, then pull a wire out of it to access its context sensitive menu. You’ll now see a new Progress function in the Interfaces section of the MyBlueprint panel. 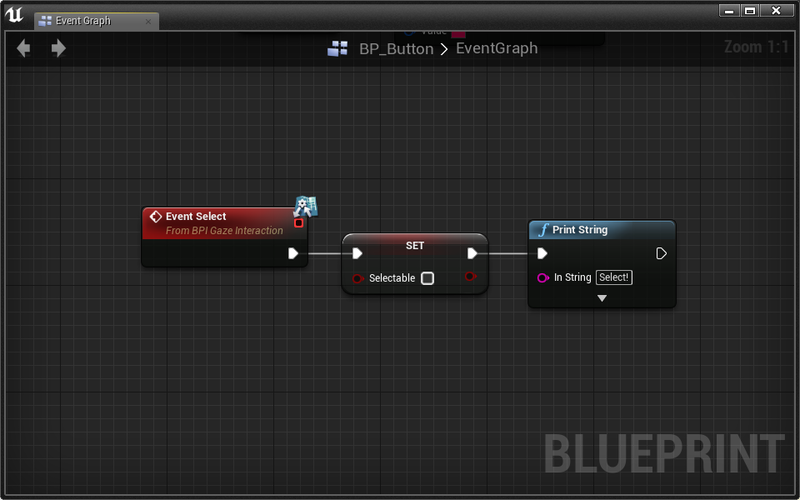 This function appears here rather than as an event in the Event Graph because it has an output. You won’t see the new function unless you Compiled your BPI_GazeInteraction. 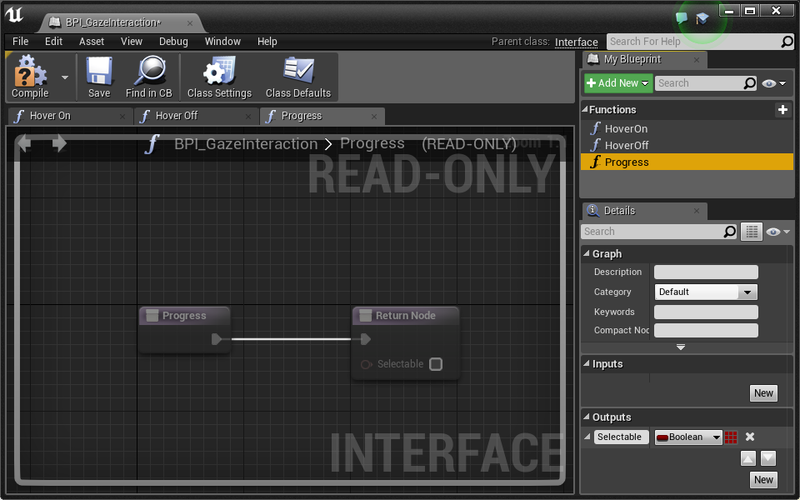 Now our BP_Button class has implemented the Progress message/function. 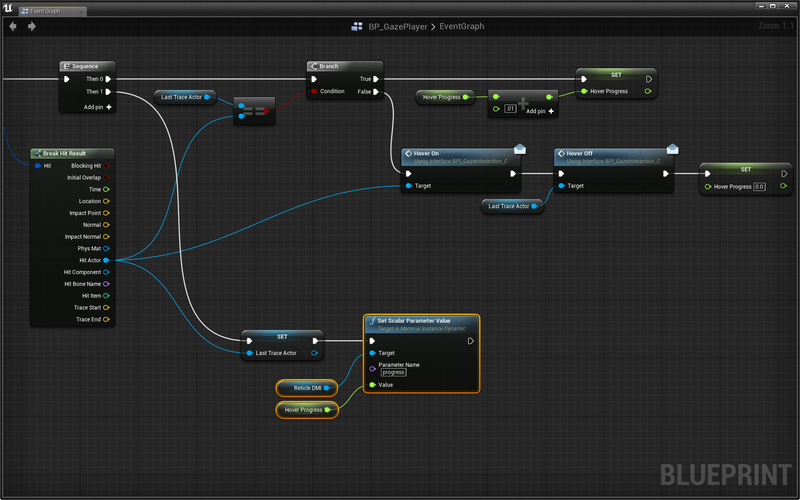 With this done, we can go back to our player and send that message to ensure we’re hovering over a selectable button. Excellent! Now all we have to do is select our button when HoverProgress reaches 1. This calls for another BPI message. When HoverProgress reaches 1, send the Select message to the button. Okay, so you’ve noticed how once HoverProgress reaches 1, we fire Select over and over again. Let’s fix this on the BP_Button side by making it unselectable for a short amount of time. First, let’s add a boolean variable Selectable that we can switch from true to false. Set it’s default value to True! Now we have to return this variable in our Progress function rather than always return true. On Event Select, set Selectable to false. Try it out! Now you can only select each button once. Great stuff! To finalize the button, let’s add an animation of it moving up and down, then reset Selectable back to true so we can continue to press it. Use a Timeline to animate the button up and down once Select is called. Once the animation is over, set Selectable back to true so we can continue to press the button. 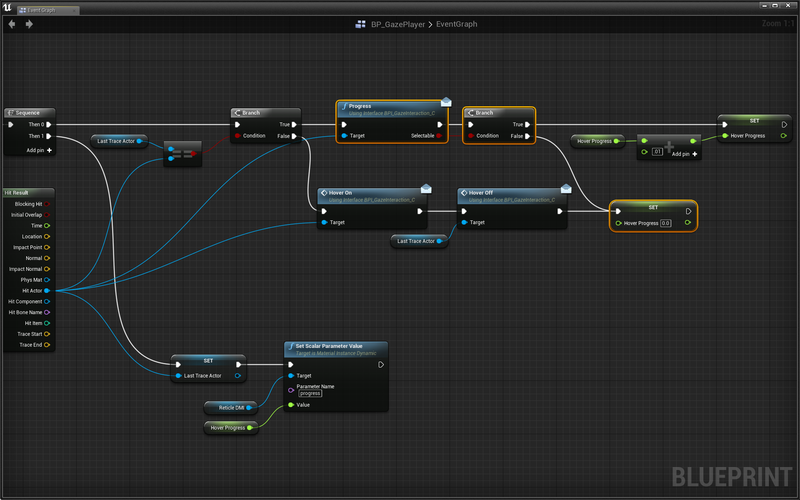 After a bit of set up, you now have a very extendable and reusable gaze based interaction interface. 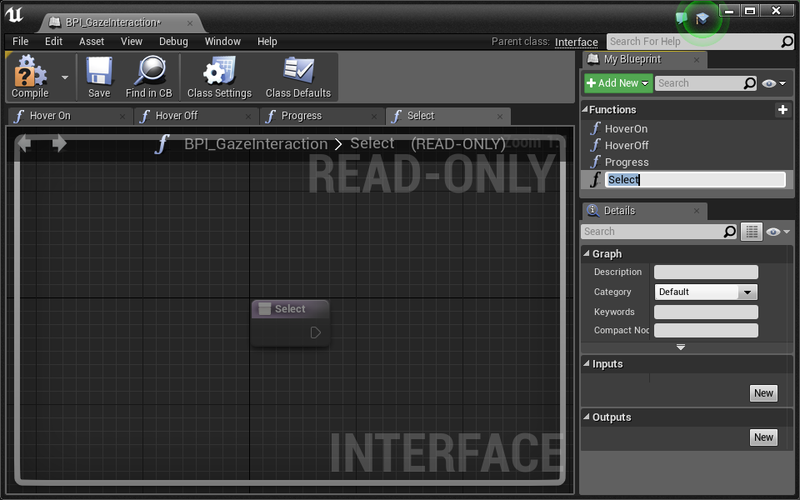 With the same (or slightly altered) BP_GazePlayer you can easily create all types of variants of the BP_Button to make your own unique form of gaze based selection. If you want to continue using the M_ProgressReticle, make sure to make a Material Instance out of it to see all the ways you can customize it. Check out the Lessons > GazeSelection > Examples folder for more ideas on how to extend this form of interaction and selection. Consider how your experience will be both passive and interactive. Any materials you create should meaningfully improve the experience.